Sasnkrit name Yudhisthira (युधिष्ठिर) denotes a person who is firm or steady in a war. Yudhisthira is a combination of the Sanskrit word yudhi means 'battle' and sthira mans 'firm'. Reference of Yudhisthira is found in the Mahabharata where Yudhisthira is the name of eldest Brother of Pandavas, who stood for what is right even in the worst scenarios. Yudhisthira is also known as the eldest son of Pandu and Kunti. Yudhisthira is often called son of God of Dharma. Yudhisthira first succeeded Pandu brothers as king of Indra-Prastha and afterwards Hastinapur when the Kuru princes were defeated. Reference of this name is also found in Harivansh (हरिवंश) and Purans. In Harivansh Yudhisthira is mentioned as a son of Lord Krishna. Yudhisthira is not a popular name in the USA. Yudhisthira is used by many people in India as the name of their babies. 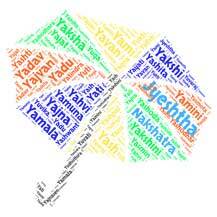 Yudhisthira is used by only 20 people as the name of their children. Different variances of Yudhisthira are used by more than 125 people in India. In our opinion Yudhisthira has a great mythological significance. This name is classic and unique. In the Hindu epic Mahabharata, Yudhisthira was the eldest son of King Pandu and Queen Kunti and the king of Indraprastha and later of Hastinapura (Kuru). Upanshu is a word popularly used among Hindus as a masculine..